Austrian Karl Schranz could be forgiven for deciding that he was the victim of a mysterious Olympic curse. Despite being widely recognized as one of the very best Alpine skiers not only of his generation but perhaps of all time, he never won the Olympic gold medal his talent merited. 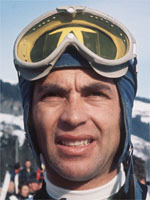 The Austrian should have had his first shot at Olympic gold at Squaw Valley in California in 1960, but he was de-selected after a bust-up with the Austrian team organizers. Four years later, at Innsbruck he was favourite to win the giant slalom but was unceremoniously shut out by the Frenchman Francois Bonlieu and had to be content with a silver medal. After a shaky sixth spot in the first heat of the slalom at Grenoble in 1968 he had a lot of work to do to catch up with the French flier Jean-Claude Killy, a victory still being possible. In the second heat, in thick fog, Schranz suddenly and dramatically skied out when approaching the 21st gate, claiming he had been distracted by someone wandering across the track. He was given a second chance by the officials and skied a tremendous second heat to take the top spot ahead of Killy. Six hours later Schranz was disqualified, the officials deciding not only that he had pulled up for no valid reason but that he had missed a number of gates higher up on the track. Olympic misery for Schranz continued four years later on the eve of the Sapporo Games in Japan. Just four days before the opening ceremony the Austrian he was disqualified for professionalism. International Olympic Committee chief Avery Brundage was known to be strict when it came to applying the Olympic rules, especially article 26 of the charter, which stipulated that all athletes must have amateur status. Many supporters and fans saw the Austrian as a scapegoat in an increasingly hypocritical skiing environment where most skiers had already turned semi-professional anyway. He returned to Austria to a hero's welcome and retired shortly afterwards, ending a marvellous career during which he had dominated the Alpine skiing scene for 16 years and won 120 races in all, including three World titles in the downhill and combined. He holds the record of Kandahar victories (seven) and twice won the World Cup overall title in 1969 and 1970. Today he runs a luxury hotel in his home resort of St Anton where the 2001 world championships took place.